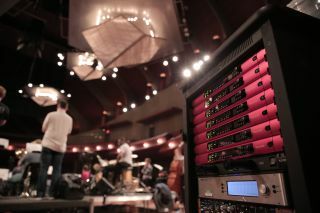 Los Angeles, CA – The College of Music at the University of North Texas (UNT), in the Dallas-area suburb of Denton, implemented a large installation of Focusrite’s RedNet range of Dante™-networked audio converters and interfaces in 2015. At the time, a total of 44 RedNet units were connected to create an efficient and cost-effective digital audio network that links a total of nine performance spaces, including the school’s two main performance halls and a portable jazz workshop, as well as two audio mix/control rooms. Nearly three years later, the entire network remains solidly in place, providing enormous technical efficiencies and measurable economic benefits, even as the network has been recently expanded with additional units. “In three years, there hasn’t been a single problem with the RedNet network, and adding new units has been as easy as adding a new computer to a network,” says Blair Liikala, Manager of Recording Services at UNT’s College of Music. He says further that the RedNet network is used to transport audio throughout the College of Music’s complex of rooms, as well as for live streaming of performances there through the building’s audio control rooms. In addition, the RedNet audio network acts as a guide for a video network the school has added over the last year, which runs on a separate but parallel network from audio. RedNet’s robustness and flexibility have helped UNT streamline its workflow — for instance, Liikala says the time saved from having to patch the 64 channels of digital audio the RedNet system provides has allowed the department to add to and improve its services menu. “We can save settings and recall them at the push of a button, instead of having to rebuild a mix we set up months earlier,” he explains. “There’s a definite economic benefit to the network.” And the addition of a pair of new RedNet PCIe cards, which deliver up to 128 channels I/O with under 3-ms latency, now extend the network to the College of Music’s Logic Pro DAW and MIDI sequencer software. newly added: two additional D16R’s (used as the interface with the video system, for embedding audio for video).